My school year has taken off in whirlwind fashion once again, my Reading Lab groups are in full swing and I'm trying to re-organize my reading lessons in order to maximize student progress. I've also managed to get myself involved in a Special Education cohort focused on reading disabilities so that I can answer the new, popular reading question: Is my child dyslexic? Needless to say, although I've been on a quest for simplicity, relaxation, and finding more time for writing, I can never seem to get there. In order to fix this problem, my new mantra is "put writing first". So, even though I have laundry to fold, yard-work to do, lesson plans to write, and e-mails to respond to, I'm going to sit in this chair and not get up until this post is publishable. Beginning of the year assessing is finally finished and last week I began working with my small groups of Kindergarten-3rd grade students. One of my goals this year is to provide my students with more targeted instruction based on their needs. This will be quite the tall order, since I work with close to 40 students each day, however, my job is reading intervention and I need to be doing more explicit teaching of strategies than students are getting with their regular classroom reading program. I also, want to provide them with strategies that they can take back to their classrooms and homes to apply to their reading. Last week my lessons focused on classroom rules, getting to know the groups, and learning how to pick out "just right" books. If you have a reader in your house, you probably know that when your child reaches a certain age, usually by 2nd grade, he/she if very aware of his/her reading ability compared to others. He/she is also, usually very aware of what other children are reading. It only takes one student "reading" Harry Potter to make a whole class of 2nd graders think they should be "reading" Harry Potter too. While I see the value in a good healthy challenge and I would never discourage a child from reading, more reading growth will happen if students are consistently placed in books with just the right amount of challenge. Earlier in the year, I observed in my school's 3rd grade classrooms and witnessed a series of lessons on choosing "good fit" books. They brought in a bag of shoes of different styles and sizes and showed students that although there are a variety of shoes, you have to think about size and purpose. What shoe fits one person, won't necessarily fit another. For example, you might love fancy heels, but you wouldn't want to wear them to go for a run. Also, all sneakers aren't the same size, so a size 10 running shoe probably isn't going to fit you if you're a size 7. So although your buddy might be reading Diary of a Wimpy Kid, that doesn't mean it would be a good fit book for you. Their lessons also focused on using the acronym I PICK (Puporse, Interest, Comprehension, Know-words), to help students learn to pick "good fit" books. Although, these lessons are fantastic and I loved the way they used the shoes as an analogy to picking books, I didn't want to step on any toes (no pun intended), by using the same lesson with my 1st and 2nd graders. So I googled "picking just right books" and came across a variety of anchor chart images. Several of them used an analogy of riding a bike to choosing a "just right" book and I thought many of my students could relate to riding a bike. I drew a picture of a bike going down a hill on my classroom white board and asked my students to tell me about riding a bike down a hill and what happens, I wrote "too easy" beside the picture and we listed what happens when a book is too easy (you go fast, don't pay attention, know all the words, boring). Then I drew a picture of a bike going up a hill and wrote "too hard" beside it. We listed what happens when book is too hard (slow, hard work, 5 finger rule-miss more than 5 words on a page, don't understand). Lastly, I drew a picture of a bike on a straight road and I wrote "just right" beside it. We listed characteristics of books that are just right (know most of the words, not too fast or slow, understand the story). 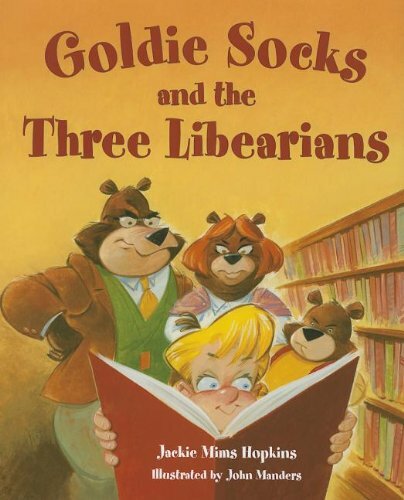 The next day, I read the story Goldie Socks and the Three Libearians written by Jackie Mims Hopkins and illustrated by John Manders to my groups. Now, I did borrow this book from a 3rd grade teacher and I'm pretty sure she read it to her class, but as a teacher it's really hard to pick a book that no one in your class has ever heard or read before, so hopefully they'll forget by the time they're in 3rd grade. Plus I always tell my students that I read my favorites over and over again, which is the truth. In Goldie Socks and the Three Libearians, a little girl takes a shortcut through the forest on her way home from school and finds a house made of books belonging to the three "Libearians," (Papa bear, Mama bear and baby bear). In the house, she finds books that are too hard, too easy and just right. It was a great review for what we had talked about the day before with the bikes and books. Goldie Socks even used the 5 finger rule strategy to find good books for herself. After finding her books, she also found a nice cozy reading space, which is equally as important as what you are reading. You don't want to be too uncomfortable while reading, or too comfortable for that matter. The day after my Goldie Socks reading, I showed my students an Anchor Chart that I made using our white board notes outlining How to Pick a Just Right Book. I plan on laminating this gem and hanging it in my classroom for reference. Every night my students are invited to pick out a book from my leveled book baskets to take home. I know my students are taking home books from the library and possibly from their classrooms, but I just want to be sure that at least they have one book on their reading level that they can read. Each day after they choose their books, I have my students read me the first page of the book to ensure they are picking something they can read. If he/she knows all the words, I encourage him/her to choose something a little harder. If he/she misses several words on a page, then I make them choose from a different lower level basket. For now, many students are choosing easy books, but I'm hoping with a little guidance, they'll be choosing Just Right books all on their own. As a teacher, I love getting new books for my classroom. I especially love getting new, free books for my classroom. There are so many great books out there (and I am very partial to my favorites) so it's sometimes hard to branch out and spend money on new books that might not be as "good". 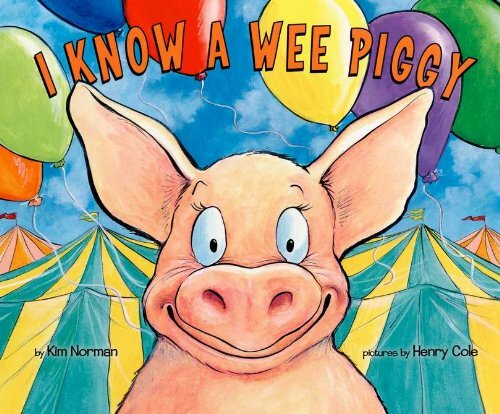 Upon receiving some free books (ordered with bonus points) from my classroom's latest Scholastic book order, I came across a book that is sure to be added to "my favorites" list; I Know A Wee Piggy written by Kim Norman and illustrated by Henry Cole. First let me start by saying, I was drawn to purchasing this book solely on the fact that it was illustrated by Henry Cole. I am drawn to Cole's childlike illustrations and bright colors like a moth to my front porch light. I know they say you shouldn't judge a book by it's cover, but I just can't help myself when it comes to Henry Cole. Perhaps it's because I've seen him in the flesh on two occasions and he used to be a regular teacher like me. Or maybe that's just why his name sticks in my head when I see it on the front cover of a book. Either way I think his illustrations are fabulous and chances are if he's illustrated a book, then I'll definitely read it. And usually I'll like it too. If you've read any of my other book reviews, you might know that I'm a little bit partial to the story, "There Was An Old Lady Who Swallowed a Fly" because it reminds me of my Granny. I Know A Wee Piggy has the same cadence but tells the story of a little piggy at a county fair. This little piggy is somewhat of a mischief maker as he "wallows" in different colors all over the fair. I Know A Wee Piggy would make an excellent addition to any farm, color or rhyming unit in the younger grades. It would also be a fun vocabulary read aloud for upper grades. I love the use of the word wallowed. Perfect for all ages, you'll definitely want to add this book to your children's book collection!